Here is the list of books that I read in 2018 with my ratings. It’s great to have an overarching focus, theme or motivation to dedicate a year to. And I like the ideas offered by Leo Babauta and David Cain about ‘going deeper’. What’s your blog about? That is the first question posed for the yearlong Twitter challenge for library professionals to #glamblogweekly. Katie of Strawberries of Integrity gave an efficient bullet point list to answer this question. And I relate to most of those: life, bereavements; family; music; movies; reading; some library…I would add art; books; design; podcasts, tech, genealogy, and general musings. So I began blogging in 2006 with The Blog of a Footballer’s Mother. This was very much a journal about following the journey of one of my sons as he became an AFL footballer. I then started French Accent as a way to pursue my love and appreciation for French culture. This blog remains online but I don’t post there anymore, despite my continuing yearning for some elusive French quality in my days. Soon after I started SuesBent and have been dabbling ever since. ‘suesbent’ is the abbreviation of my name back when Hotmail first appeared and 8 characters was the limit for the username. (showing my age) I use it to sign my paintings too. I like the play on words that “Sue is bent” because I do see the world from an alternate view and love the unexpected things in life. I love Chaos Theory, Quantum Physics, Mandelbrot Theory, and yes I am a geek. In the library world I love the work of Tim Sherratt. Not that I write about these topics because I am just an appreciator in those lofty realms. In recent years, since my parents died, I have found my ‘voice’ become silent. I have explored the reasons but it still eludes me. So I embrace this challenge to #glamblogweekly as a means to find my voice once again. Bring on the questions. All of the books that make it to the reading challenge list I did actually read to the end. Books I Did Not Finish aren’t listed. 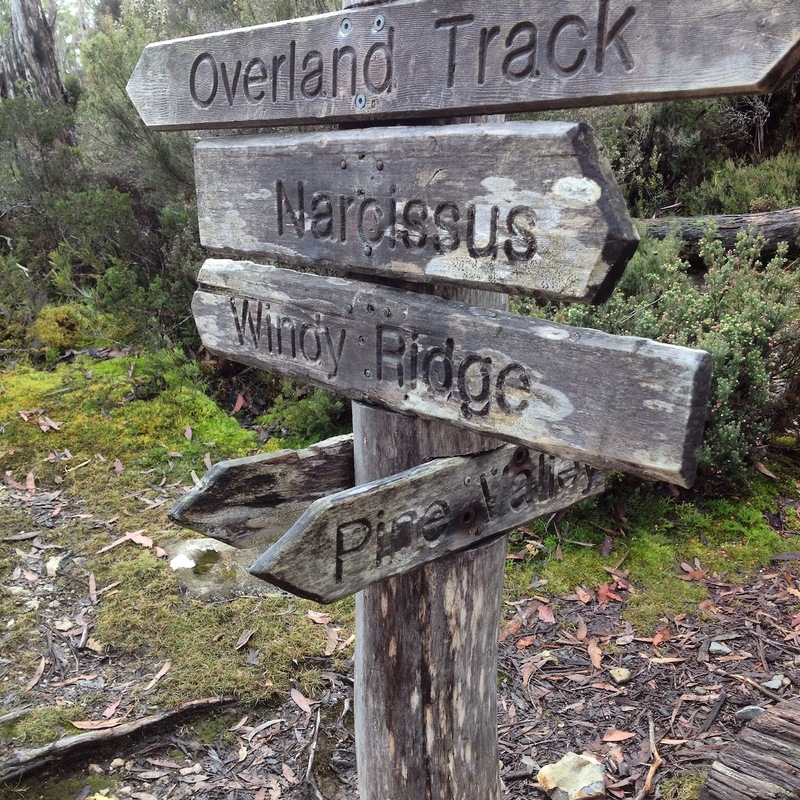 If you were looking for a description of the Overland Track walking experience in Tasmania you could easily find many written and photographic books on the subject. And while in this account, I will not attempt to write a blow-by-blow (step by step) description, it must be emphasized that any second-hand account will fail to provide you with the actual experience. You must immerse all of your physical body and senses into the scene in order to appreciate it fully. From a distance the landscape can appear grey, dull, olive green, and even boring. Up close the colour and diversity of plants, flowers, rocks, mosses, bark, fungi, water, etc., arrest the eye continually. Just when you relax thinking you have seen all there is to see, suddenly a new intricate variety appears and stops you in your tracks. I was amazed to see a toadstool I’d never seen before – pale red and green with a frilly white skirt. I only saw one. The sights are awesome. Towering mountain crags where eagles dive for fun. Tolkeinesque mossy green forest paths that wind around the roots of 800 year old trees. Vast alpine plateaus where yellow button grass hide tiger snakes and shy furry animals. Waterfalls in full flight. Lakes too cold to dip a toe. Rocks, trees and flowers arranged by The Master Landscape Gardener, and then dusted with fresh falling snowflakes. The fragrances were intense. The nutmeg aroma of wet wild Sassafras. The gin and tonic spritz of the celery top bush. Eucalypts, Myrtles, Banksia, King Billy Pine, Beech and more. 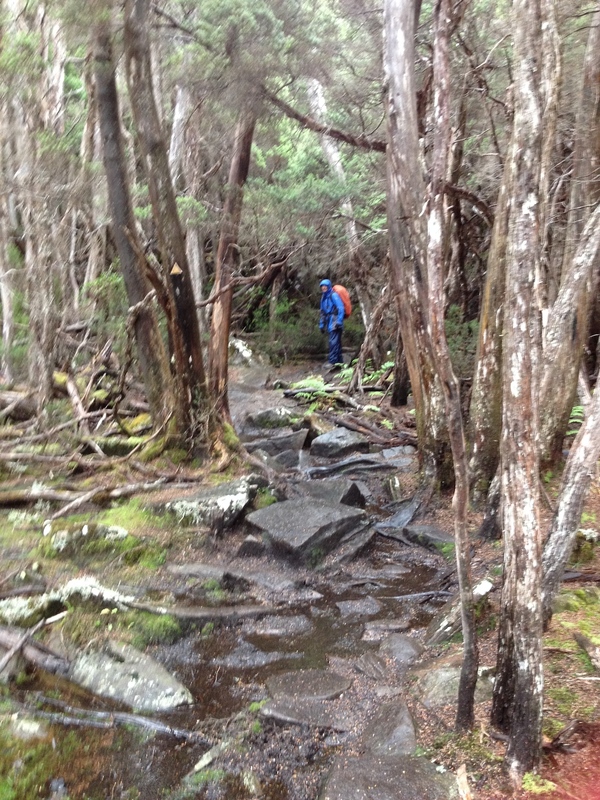 The tiresome experience of pushing your body along paths full of rocks, mud, water, tree roots, steps, streams, and leeches, in driving rain was a challenge experienced by all in the group. We signed up for the ‘chardonnay version’ with Cradle Mountain Huts. We had a bed in a warm hut at the end of every day. Our packs did not need to carry food, or bedding or tents or cooking gear. Our guides led us, cajoled us, cooked for us, and cleaned the huts after we left. Our guides were awesome and extraordinary individuals proud and passionate about this unique environment and Tasmania in general. The huts were warm, had hot showers, drying rooms for our wet muddy boots and clothes. We had three course dinners with local wines. It felt like the privilege that it was. I wrote a haiku for each day in my mind. I took photographs galore. We were touched by a tragic incident halfway along the trail reminding us of the need to be careful in this remote wilderness. Out of network range the guides used the satellite phones to call in the Air Ambulance helicopters. We pushed on. My knees struggled to complete the journey and did so with tape strapping and walking poles. At last we arrived at our destination all too soon – Lake St. Clair on Day Six. Lunch on the jetty waiting for the boat to pick us up, we basked in the warm sun, appreciating the journey. I recommend this experience BUT be prepared for a difficult walk where EVERY footfall must be decided before it is actually taken. GoodReads is a fantastic online tool for keeping track of your reading and I have been using it for the last couple of years. By contrast LibraryThing is great for recommending books that suit your reading and uses crowd tagging extremely effectively. I used the reading challenge within GoodReads setting my goal at 50 books for the year. I am not an especially fast reader and tend to abandon a book if it doesn’t grab me in the first chapter. With this challenge I was encouraged to read books to the end, and this worked well for the most part. I read 28 non-fiction books; 10 fiction books; and I did not finish (abandoned) 4. Only two received five-star ratings: one non-fiction and one fiction. Also note the prevalence of self-help books. This is no surprise as it is a genre that I have always been fond of reading, ever since my father first introduced me to the book “The Power of Positive Thinking” by Norman Vincent Peale. The last two years have been a challenging time for me personally trying to come to terms with the deaths of my mother and father, and life without them. This tendency to read self-help books has been validated by the efforts of the Reading Agency in the United Kingdom, where their “Books on Prescription” program and the “Mood Boosting Books” program show the power of reading to lift us up out of habitual and damaging thought patterns. I plan to use GoodReads again to challenge myself once again in 2015 and I think that the target of 50 books remains a good one for me.